Amato, G., M.G. Egan, and G. B. Schaller. 2000. Mitochondrial DNA variation in muntjac: evidence for discovery, rediscovery and phylogenetic relationships. Pages 285-295 in Antelopes, Deer, and Relatives. E. S. Vrba and G. B. Schaller, eds. Yale University Press, New Haven. Dong et al., W. Dong, W., Y. Pan and J. Liu. 2004. The earliest Muntiacus (Artiodactyla, Mammalia) from the late Miocene of Yuanmou, southwestern China. C.R. Palevol. 3(2004):379–386. Giao, P. M., D. Tuoc, V. V. Dung, E. D. Wikramanayake, G. Amato, P. Arctander, and J. R. Mackinnon. 1998. Description of Muntiacus truongsonensis, a new species of muntjiac (Artiodactyla: Muantiacidae) from Central Vietnam, and implications for conservation. Animal Conservation 1:61-68. Groves, C. P. and P. Grubb. 1990. Muntiacidae. Pages 134-179 in Horns, Pronghorns, and Antlers. G. A. Bubenik and A. B. Bubenik, eds. Springer-Verlag, New York. Schaller, G. B. and E. S. Vrba. 1996. 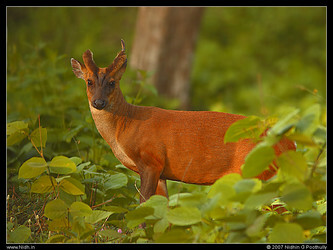 Description of the giant muntjac (Megamuntiacus vuquangensis) in Laos. Journal of Mammalogy 77:675-683. Wang, W. and H. Lan. 2000. Rapid and parallel chromosomal number reductions in muntjac deer inferred from mitochondrial DNA phylogeny. Molecular Biology and Evolution 17:1326-1333. Page: Tree of Life Muntjacs. The TEXT of this page is licensed under the Creative Commons Attribution-NonCommercial License - Version 3.0. Note that images and other media featured on this page are each governed by their own license, and they may or may not be available for reuse. Click on an image or a media link to access the media data window, which provides the relevant licensing information. For the general terms and conditions of ToL material reuse and redistribution, please see the Tree of Life Copyright Policies.